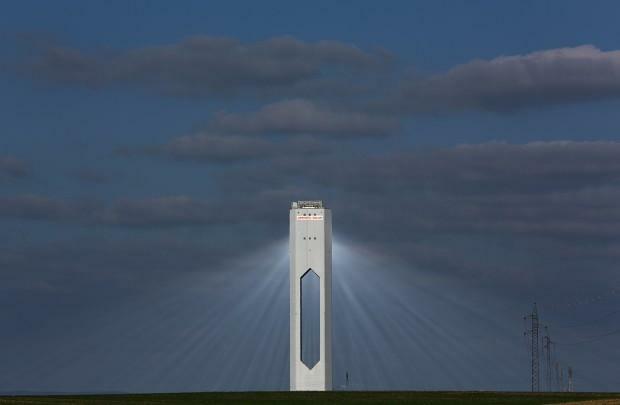 A tower at Abengoa solar plant at "Solucar" solar park. Photovoltaic solar panels (foreground) with the PS10 concentrated solar tower in the background at the Abengoa Solucar complex outside of Sevilla, Spain. A view of the tower with the pressurized steam tank that allows for the production of solar energy after the sun goes down. About an hour’s drive outside of Sevilla, Spain’s old city, past grazing black-footed pigs and olive orchards, sits the Abengoa Solucar complex, and it’s truly a sight: Imagine cresting a hill and then all of the sudden seeing several large towers, over 500 feet high, with hundreds of beams of light striking them — solar rays from an army of mirrors arrayed in a circle on the ground below. They’re called heliostats. “These heliostats are reflecting solar radiation toward the receiver that we have at the top of the tower,” says Valerio Fernandez, manager of the complex. The rays from the heliostats strike the top of the towers, like hundreds of magnifying glasses focused on one point in mid-air. The top of the tower shines so bright, you can’t look at it without sunglasses. Once the solar radiation gets to the top of the tower, it’s used to heat up water. And it’s at this step that innovation turns to a technology that’s been around for well over a century: turbine technology. The solar radiation creates heat, that heats up water, which creates steam, which moves the tubines, which generates energy. In the summer, there’s enough sun for 12, sometimes 13 hours of energy. On a good, sunny day, there’s enough solar energy generated here to power 100,000 homes. And the towers can keep providing solar energy for several hours after the sun goes down, by heating and pressurizing steam for later. 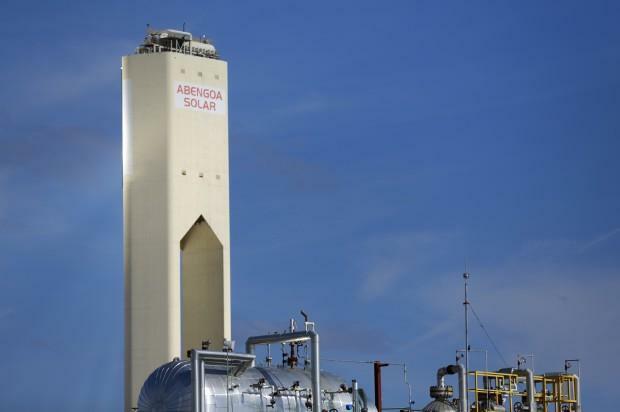 Valerio Fernandez manages the Abengoa Solucar solar complex outside of Sevilla, Spain. It’s not just here in Sevilla where solar has taken off. Spain is one of the largest producers of solar technology in the world. It’s second only to Germany for solar power generation in Europe. There are two reasons why Spain has become a solar king. Starting in the mid-2000s, Spain heavily subsidized solar energy and passed policies removing barriers for large-scale projects. “A lot of people would criticize them for that and say they went overboard. They pushed the subsidies too far, too fast,” says Webber. Spain, in essence, took a gamble. For a while, Spain was the world leader when it came to solar energy, installing more and coming up with innovative ways to harness the sun. But in recent years that wave has crested. When it comes to solar, Webber says, Spain was the first mouse. “There’s a penalty for being first to market. Because you buy the most expensive forms of solar. And you might pick the wrong technology,” Webber says. And based on the current solar market, one could argue Spain picked the wrong technology. Prices for solar panels, which generate electricity directly from the sunlight, have plummeted, mostly thanks to unprecedented production in China. 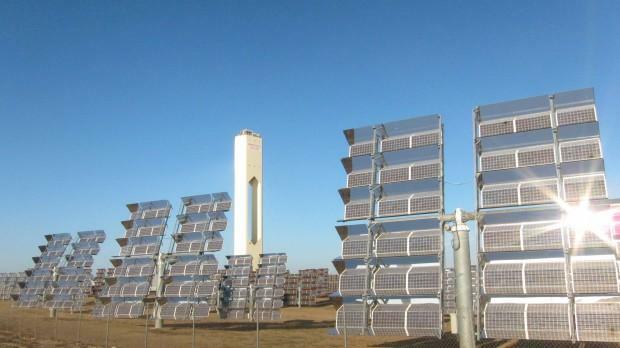 But the price for Spain’s solar thermal technology that uses mirrors hasn’t fallen much. 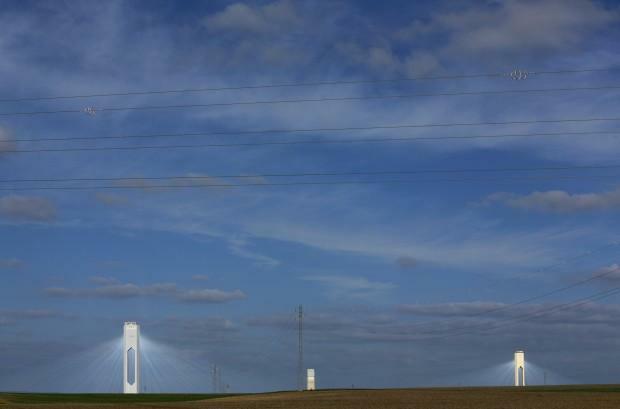 That’s why as Texas makes its own solar push, solar towers like the ones Spain aren’t likely to play a role. Instead, expect vast solar farms with photovoltaic panels stretching out across the state’s abundant, flat and cheap land. Webber says the state is also very unlikely to repeat the policies of heavy incentives and subsidies that Spain did. Texas has growing demand, Webber says, with more people moving here every day. And the peak of that demand — hot, sunny summer afternoons — is when solar could really shine. It’s getting easier to see how that prediction could come true. While many Texans rooftops will look the same, energy companies are likely to move forward with large-scale solar farms, Webber says. This summer, Austin Energy signed a record deal for solar. The deal guarantees clean power from the sun at a prices cheaper than fossil fuels. This is the first in a three-part series on renewable energy and sustainability in Europe and its lessons for Texas. This series was made possible by a Energy & Climate Media Fellowship with the Heinrich Böll Foundation of North America. Tune in tomorrow for Part Two, when we’ll visit an offshore wind turbine in Denmark. Austin Energy will soon be getting more of its power from the sun. 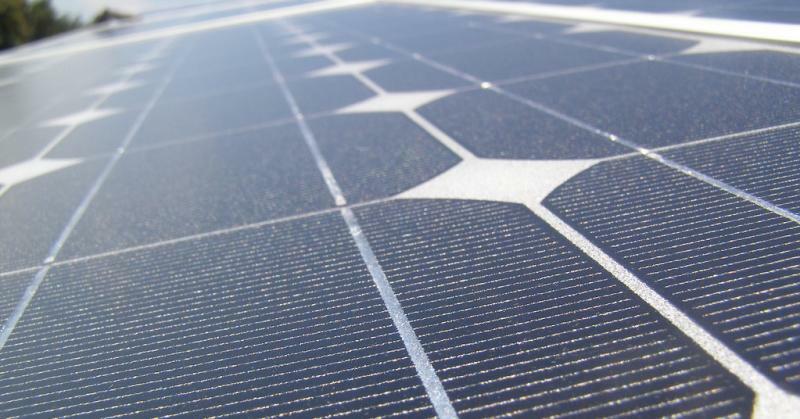 The city-owned electric utility has signed a deal, announced today, with a San Francisco-based firm to build the single largest solar facility in Texas by 2016. Under a 20-year power purchase agreement, Recurrent Energy will build a 150-megawatt solar farm in West Texas. Austin Energy spokesperson Carlos Cordova says the deal will help the public utility and the Austin City Council to achieve two goals – "to have 200 megawatts of all of our energy derived from solar power, and 35 percent of all of our energy be derived by renewable energy." The largest solar farm in Texas is now pumping power to homes across Austin. The $100 million facility was switched on last month and city officials held a ribbon cutting ceremony today. The solar farm is located about 20 miles east of Austin in Webbervile. Its footprint covers 380 acres, which is about the size of Zilker Park. And it has 127,000 solar panels that slowly shift to follow the sun’s path. The solar farm can generate up to 30 megawatts, enough electricity to power about 5,000 homes. The energy is being dispersed throughout Austin Energy’s grid. While the solar array can't provide power all the time, it could provide big benefits during the hot, sunny days of summer. The Electric Reliability Council of Texas (ERCOT) has warned that Texas could have a hard time meeting energy demand if the summer of 2012 is the summer of 2011, when the state was brought to the brink of rolling blackouts. And ERCOT chief Trip Doggett couldn’t say the Webberville solar farm would be able to solve those challenges.